Mounting Plate: 6-1/4" x 7-1/2" x 1/2"
Bolt Hole Spacing: 4-1/2" x 6", slotted to 4-1/8" x 6-1/8"
Phenolic wheels (also called Durastan) provide excellent service even in wet and cold applications. They resist degradation, deterioration, and corrosion from oil, grease, and commonly used acids and solvents. Recommended for all types of floors except resilient tiles. 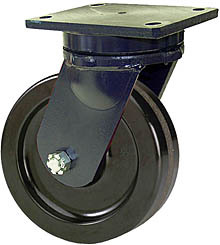 Straight roller bearings consist of a cage-type roller assembly and a split outer race. These bearings turn on hardened and ground spanner bushings which provide a long wearing precision inner race. Press fit combination metal retainer/thrust washers hold the bearings in place. Straight roller bearings have a high radial capacity, but minimal side thrusting load rating.